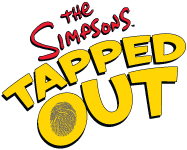 Today the The Simpsons: Tapped Out started missions for the 2013 Season 25 Premier "Homerland". The update was offered on September 23rd, but only one quest appeared on that date. Fortunately, the "Season Premiere 2013" (Conventional Wisdom) quests and items are now available. The missions automatically kick off on September 26 with a dialog between Lisa and Homer. Conventional Wisdom Pt.1 - Make Homer wait for the mailman for 12 hours ( 420 100) You will be awarded an additional 100 and 10 for completion. Conventional Wisdom Pt.2 - Make Homer pack for the convention. The task will take 4 hours to complete ( 175 70) You will be awarded an additional 100 and 10 for completion. Conventional Wisdom Pt.2 - Make Homer re-pack for the convention. The task will take 4 hours to complete ( 175 70) You will be awarded an additional 100 and 10 for completion. At the end of the quest you will be reminded to watch The Simpson's 25th Season Premier. 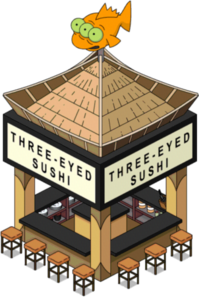 You will also be awarded a FREE Three eyed Sushi eatery decoration for your Squidport.